Anyone who even has half a thought that they might go to one of Faye's Copic workshops should definitely sign up! I promise you will not be disappointed. Faye is a brilliant and patient tutor and takes enormous pride in equipping everyone with the right tools and skills to colour successfully with Copics. Honestly - Faye is a marvel, she plans the sessions carefully and thoroughly to make sure you get the best from them. 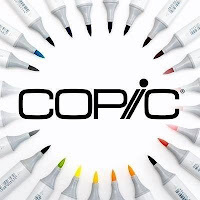 I would nt hesitate to recommend the classes - I started my Copic adventure with Faye in 2015 and I completed my Copic Certification under her tutorage in 2016 - it has been worth every mile and every penny! Big thank you Faye my lovely friend. Whether you are new to Copics or pretty experienced in using them I highly recommend Faye's courses. I love colouring and felt my colouring was good but not in Faye's league. I wanted to improve my skills and had been longing for Faye to come to Norfolk so I could attend her classes. I learnt so much. Faye is so well organised with her classes, so patient and encouraging. When someobody said they had coloured something and it was rubbish she didin't accept that and showed them how to improve it. She explains everything so well and makes it such fun to learn. I did Copic one and two, skin, hair and fold classes and was so glad I signed up for all of them. I can't wait to do three and four now. I have coloured some images since I did the classes at the weekend and can see such an improvement already. If you are debating whether or not to do them, then stop debating and sign up. You will love it and will learn so much. Worth every penny. After all Copics are a serious investment so attending the classes will improve your skills so much and make you love colouring even more. I was on the same course as Marianne, in fact I think I was the one who said my colouring was rubbish! my Promarkers. Just a small example of how much thought and effort goes into her classes to make sure everyone gets the most they can from them. I class myself as a person with 'average' colouring skills but her patience and encouragement made me want to, not only improve them but also aspire to be a fraction as good as she is. Apart from Faye costing me a fortune (because I have now had to purchase Copic pens, paper etc) she has been such an inspiration to me. I can honestly say the course was worth every penny and I would recommend it to anyone who wants to learn to improve their colouring. I was a beginner too when I took a one to one class with Faye. I was a bit apprehensive as I thought I was rubbish at colouring but like the ladies above have said, I needn't have worried at all as Faye mmediately makes you feel welcome and at ease and pitched the class at my level and ability. She is extremely talented and very encouraging and I learned such a lot. When I left, I immediately wanted to go out and buy a gazillion copic markers as I felt so inspired!! Thank you Faye and as Arnie said..... 'I'll be back'!!! So I've now completed copic 1, 2 and 3 as well as the skin, hair and folds classes. Whatever your skill level you'll learn heaps with Faye. I'm OK on animals but people were a subject I avoided especially if there were folds in clothes. I'm now comfortable at folds and would now be happy at tackling all those stamps I've avoided for years now. Also there's cakes and quite often a pop up shop from dies to die for so what's not to love? Fab course content with a patient, funny and lovely tutor. Demonstrations of how to do each stage of the colouring techniques followed up by one to one advice. The classes are small enough to be comfortable and lively with like minded people. I can only say a perfect day. Looking forward to the next class and hopefully bumping into some of the lovely people I met on the course. Attended the afternoon session on the 23rd of September at Bailiff Bridge, it was a really great afternoon and Faye is so very talented but not a DIVa, down to earth and very talented. She has the patience of a Saint and a great sense of humour. I am rubbish at colouring and to be honest prefer Pro Markers to Copics, but she didn't hold that against me, and was extremely helpful and kind. Great sense of humours and a very, very enjoyable afternoon. If you have doubts about attending one of her classes then, forget them as I am sure you will regret it if you don't join in. I would not hesitate to go on another of her classes. Great group of people too. The Dies to Die For shop was just amaizing. Wow! What a truly lovely day yesterday :-) I have been playing with Copics for a couple of years but I learnt so much yetserday doing the Copic One workshop and the 3 additional classes in the afternoon. Faye is so encouraging, warm, friendly and funny - and not forgetting an amazing colourist! I loved the demos but the one to one advice was brilliant so thank you for inspiring me to colour again. Thank you to the team for the seemingly endless coffee, cakes and choccies - very much appreciated. Thank you also to Tracey and the Dies to Die for shop - tho please could you ask Andy to mumble the totals in future - I fear the bank manager may have heard! A brilliant day Thank you all again. Now - Is it March yet? I love Faye's fun approach to colouring, so much that I've just attended my third session and booking the forth! Faye takes the time to make sure everyone understands the techniques being shown and helps everyone individually to achieve the best results! What a fabulous way to spend a Saturday. I wasn't sure what to expect having attended a few crafty classes in my time but this suppassed everything I'd hoped for. Faye is a teriffic instructor and has a wonderful sense of humour to boot. The whole crew made our day just perfect with such lovely attention to detail and I've come away with a whole new confidence in my colouring ability. Can't wait for the next class. I spent an amazing day on Saturday, along with my friend Debbie, at Faye's Copic colouring one class. It was a fantastic day! I am new to Copics so I was a tad nervous but Faye was so lovely and welcoming, and despite not really having a clue what I was doing, with Faye's help,patience and a great ability to explain the techniques so clearly, I began to feel less nervous! Having Debbie next to me as well was a big bonus (as her colouring is fantastic!) and with her help too, i came away so pleased with the day, and delighted with how much I feel I learnt. So a huge thank you to Faye and not forgetting all the ladies who kindly kept us fed and watered all day! If that wasn't enough, Tracey from Dies To Die For was there with the most amazing shop you could wish for! Thank you Tracey and hubby too! I am so looking forward to the next class and I can't wait for March! I have now completed Copic Colouring One, Two and Three with Faye and had a fabulous time at each of the classes and learnt loads. If you want to learn more about colouring or are a complete beginner then Faye is the person to teach you. As well as being brilliant at colouring, Faye is an excellent tutor. She explains each stage clearly, is patient and very encouraging. The classes are well-organised and Faye makes you feel welcome and at ease. I can highly recommend Faye, and her classes. I had a brilliant time yesterday at a Copic class with Faye! Class one complete! For anyone considering whether it's worth it - it totally is! Faye is a fantastic teacher! There was so much I didn't know just in one class! Roll on class 2! I'd highly recommend the classes! Brilliant morning colouring with Faye at Merriott. Very relaxed and Faye is a wonderful presenter and teacher. My only regret was not being able to stay all day or do the Sunday. Hopefully Faye will be this way again soon! Would recommend it to anyone who wants to learn about colouring or just needs a recap with one to one support. Thank you Faye. Thank you from the bottom of my heart Faye. Today has been totally wonderful. Completed Copic one and two. You are a brilliant tutor, a very talented artist and a kind and patient lady. I've learnt much more than i even thought of and as for 'speed colouring' ..... apart from making me laugh and panic was all so enjoyable. Roll on Copic three thats what I say! I absolutely recommend Faye's classes.. I had a great day yesterday on the copic Colouring 1, skin, hair and folds classes. Faye is a fantastic tutor, and manages to ensure that everyone in the class achieves a good result, whether they are total beginners or more experienced Copic users. I really enjoyed the day. I met Faye for the first time yesterday at one of her classes. Would definitely recommend anyone who is interested in learning more about colouring copics to go to a class with Faye, she is lovely and very talented!! And definitely helps you feel more confident with colouring. I am already thinking of doing a second class with Faye as I enjoyed yesterday so much! Well what can I say, I have just completed a weekend of Copic colouring with Faye. She is a fantastic tutor with a great sense of humour and the patience of a saint. The classes are extremely well planned and organised, with some lovely little surprise goodies thrown in along the way. I have left with my head buzzing with ideas, new knowledge and confidence. If you are reading this an have ever thought about doing a class with Faye stop hesitating and do it. The classes are worth every penny and no matter at what level of a colourist you believe yourself to be you will definitely learn and enjoy the process. Don't be put off if you think you're not good enough and will feel foolish. You will not. Faye takes the time to explain what she's doing and wanting us to achieve going over the steps until every class member is clear on the process. She spends time with everyone individually giving guidence, hints and tips. On the second day of the course I just attended (Warrington), she arrived early to help people who had been having difficulty with certain aspects of colouring the previous day. I would like to say thank you Faye for giving me something money can't buy CONFIDENCE and a belief in my own ability. I can't wait to meet you again later in the year and until then practice, practice, practice. I would like to thank Faye for arranging these classes in Warrington! I attended on the 23rd and 24th October and learnt so much from classes 1 and 2 as well as the technique classes. She is very patient, takes the time to come around all the member of the group to check on our progress through each stage. Has a wicked sense of humour as well as the patience of a saint. I came away feeling so much more confident in my colouring and everything I learnt finally gelled in my own colouring journey. I would highly recommend beginners and seasoned colourists to attend these classes as you will all achieve more than you could possibly wish for. I am so excited and looking forward to the next classes later in the year but also meeting up with new friends I made this past weekend too. Hello - I did the Copic 1 & Copic 2 Class along with technique classes. The classes were jammed packed with helpful tips and guidance that has improved my colouring already. It has also given me a renewed love of colouring which has to be down to Faye's infectious (Not as in the itchy germy type?! )personality and teaching style. This girl knows her stuff...! Plus the pop up shop is brilliant and we got fed Chocolate cake - now I can't promise that happens every class but I reckon there will be treats always!!! Basically - Its an ace course and well worth the money and I can't wait for the next one ! As a complete newbie to copics I was very unsure as to what to expect from the classes, they were amazing!! Lots of tips and techniques packed into the classes. I completed copic one and two and also an afternoon of techniques in bite sized classes. The classes were a mix of newbies and experienced copic enthusiasts. I came away with lots of ideas and gained loads of confidence in my colouring. Faye is an amazing tutor and has a delightful personality. The rest of the team also deserve a mention for supplying us with a fantastic range of products, tea and coffee all day and loads of delicious treats! It was an amazing experience and urge anyone thinking of joining us copic addicts to do so, you will not regret it. For now I’m busy practicing and trying to build a better range of copic colours and I can’t wait to do copic three and four in the future. I did Copic Colouring Class 1&2 with Faye and can thoroughly recommend it. Faye is a great teacher, learning is one on one in a small class environment with like minded people. She is constructive and honest with her feedback, which is welcome. I learned loads and attained a better understanding on light source though trust me, i’ve a way to go yet!! Can’t wait to do more classes if Faye comes back up North. what can I say...this was a fab day learning all the tips of the trade. Faye is so good at teaching, has so much patience and takes time to spend with each person on the course giving constructive feedback along the way which was welcomed. The added bonus was the big screen tv...lots of us like to watch and then try so this was great. Hopefully it won't be long until classes 3 & 4....I will defo be attending. For anybody that's in two minds about attending, then you should go, you won't be disappointed. Well done Faye and thanks you so much. As many have said before this class is amazing. Faye is a lovely teacher- very knowledgeable and patient. I will definitely be booking classes 3 and 4 the next time she comes North of the border! I attended COPIC I last Saturday and thoroughly enjoyed it. Faye's tutoring style is relaxed and encouraging but well structured with great learning materials including practice images to take home afterwards. I found the day really well-planned and executed and I felt more knowledgeable and more competent in my colouring afterwards. The fact that the classes were held surrounded by lots of lovely stash from Tracy's Dies to Die for Store was also a great attraction! Take the plunge, crafters! This is a great class and Faye is a great teacher! I have wanted to do a Copic Colouring workshop for years but sadly they were all too far away....until now! I had a brilliant day, learnt loads and had fun. Faye is such a fabulous teacher with loads of patience. What more could you want? Oh and we had sweeties and biscuits! Thank you to Tracy and Andy for a fantastic selection of stamps and tea! Can't wait to do the next one! Im Helena Wilson and i just want you all to know that i have been doing classes with the lovely faye for 18 months now. although i have completd all the courses 1-4 i still go to the classes. Faye has always got something new to show us, its a great way to keep up to date with techniques, tips and tricks and buy lots of goodies from the dies to die for pop up shop. you also get fed some lovely treats too and meet some new faces and old ones. i strongly suggest anyone from the beginner to the experienced copic user to take some classes, you can never stop learning, and Faye is an amazing teacher. HI everyone, I did Faye's Copic 2 class yesterday and Copic 1 in Feb 2018. I have a background in art but always love to learn more. I was a little apprehensive about the first course because I am not a card maker or crafter and so I wasn't sure if i'd find the content relevent. Both courses were fab. 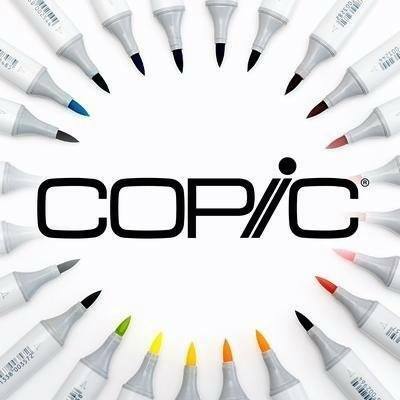 Copic one gives you lots of the basics and copic 2 takes you onto the next level. The set-up is very professional with lots of things to purchase, and you can pay with cash or card - which makes a massive difference. Faye now has a visualiser set up for the tutorials which mean that you can stay in your seat to watch the demos and draw along at the same time, rather than 'gather round and watch me' - which I do as a teacher and can be a bit of a pain. In terms of delivery, Faye is a delight. She is so enthusiastic and full of energy (fuelled by a love of life and choclit!!) and more importantly is extremely knowledgable, AND can impart her knowledge to her students (not everyone can do this - trust me!) She is flexible with all abilities and needs and makes you feel completely relaxed. I came away from yesterday's sessions feeling really motivated and looking forward to continuing my practice at home. Shame work gets in the way!!! I did Faye's Copic Class 2 at Sutton Coldfield. It was worth the trip up from Somerset. I had a fantastic morning and learnt so many new tips and techniques. Faye is a terrific teacher explaining everything simply and going around the class to check how everyone is doing with praise and advise. Anyone looking to improve their colouring skills would get something from this class. I would not hesitate to recommend it to anyone. Thank you Faye. I have already said how wonderful Copic 1 and 2 were and now I have done Copic 3. As always Faye was brilliant, explaining everything and giving lots of encouragement and praise. I can't wait to do Copic 4! If this is something you have been thinking of doing, stop thinking and just book I promise you will not be disappointed, always something to learn even if you are an experienced colourist, and loads of fun. Just do it! To anyone thinking of booking classes with Faye - DO IT !!! She’s brilliant and so patient. I’ve recently completed the first three courses and was initially worried my colouring skills would prove worse than I thought. Faye’s classes are really well planned and organised. Her teaching style is informal and she puts u at ease with her sense of humour. She is so supportive and points out the positives in what you do with tips to improve on technique. On all classes I’ve attended so far I’ve been really impressed by how she makes time for everyone in amongst the teaching and cannot believe how she remembers everyone’s names. I found Faye to be really down to earth and approachable, nothing is too much trouble and she manages to pitch her classes to meet the needs of all attendees - a highly skilled tutor and I can not recommend her enough. If you’re considering signing up for w class - crack on with it - you won’t regret it. Completed classes 1 to 4 now and several other fun ones along the way - still learning and hopefully improving. Thanks Faye for more Copic gems and Fayeisms this weekend - really great. Just returned from Copic 3 in Warrington. We also covered crazy chicks and starry skies. I had a fabulous time over the two days. I met up with lovely people whom I met a few months before on Copic 1&2. I was even invited for tea by a lovely lady that I met in the March. Relaxed learning environment, Faye welcomes you so warmly, and even remembers EVERYONES names!! Amazing. Don't worry if you've never coloured before, go along to Copic 1 and build up from there. I now look back over my older work and can see what I've learned. My images are completely transformed. You'll have such a great time I promise. Go for it...book now! Many thanks for another 2 great workshops on 27 and 28 October. I learnt lots of new techniques which I will be putting into practice the next couple of weeks. Whether you are a beginner or more advanced with Copics I would highly recommend them. It was great to catch up with friends I made at the last classes in Warrington which is always good. Just taken Copic 1, crazy chicks and starry skies at Warrington 27th October. Had to stand for over two hours on an overcrowded train to get there and wait over one and a half hours for my connecting train on the way home - but it was so worth it! Super classes, super teacher and learnt so much in a fun and relaxed way. Hoping to repeat the journey when the next lot of classes get announced, but will remember to reserve a seat! Oh and the Dies to Die For shop was pretty fabulous too. Having started to get interested in Copic colouring I saw Faye’s class listed online and decided it was what I needed to help me really understand the way to develop my skills - and boy was I right. Loved every minute of it, time went way too fast and I was gutted I couldn’t stay for the afternoon. Already looking forward to the next one and seeing improvements in the practice I have done since Saturday �� Huge thanks to Faye for being an awesome teacher and making sure everyone had support with their work. Roll on Copic 2. Oh! I am sooo sad! I have completed all the Copic Classes 1 through to 4 with the ever-lovely Faye! I may have to start again!! Just completed another one of Faye's fabulous classes! Faye creates a wonderful relaxed environment which is perfect to learn new techniques. The classes are always fun and you learn so much, even if you have done classes before you always come away having learnt something new. I always feeling inspired and motivated to carry on with my practice at home. My first classes with the fab Faye and it won't be my last! She's so patient with the beginners and also with the more experienced ones with bad habits! I initially saw Faye demonstrating with Copics at the craft show at the Motorcycle Museum in Birmingham. At the time I was using Spectrum Noir markers and having a few issues with them!! I decided to take the plunge and invest in a few Copics to see if there was any difference. Let me tell you.....there is! I love my Copics, even though I don't have a huge selection yet. What really made the difference to me though was going to my first, of many I hope, classes with Faye. She is so friendly, organised and patient. You even get a sticky note with your drink order on and the tea/coffee just appears!! I did an afternoon class in Sutton Coldfield and am looking forward to starting the 'full' four part Copic colouring course in September. Can't wait. Thanks Faye. I attended Faye's class in March 19. I went alone so was feeling very nervous but Faye was lovely and soon put me at my ease. The class was fantastic, I was surprised how much information I picked up and I was really pleased with what I had produced by the end of the day and I am really looking forward to the next class. A great day and a truly lovely instructor. Love attending Faye classes. She puts you at ease and has patience. She gives you the knowledge to use your copic to produce some fabulous colouring. Just wish I had more time to practice.